This article is about the form of asexual reproduction. For other uses, see Budding (disambiguation). Budding is a type of asexual reproduction in which a new organism develops from an outgrowth or bud due to cell division at one particular site. The small bulb like projection coming out from the yeast cell is called a bud. The new organism remains attached as it grows, separating from the parent organism only when it is mature, leaving behind scar tissue. Since the reproduction is asexual, the newly created organism is a clone and is genetically identical to the parent organism. Organisms such as hydra use regenerative cells for reproduction in the process of budding. In hydra, a bud develops as an outgrowth due to repeated cell division at one specific site. These buds develop into tiny individuals and, when fully mature, detach from the parent body and become new independent individuals. Internal budding or endodyogeny is a process of asexual reproduction, favoured by parasites such as Toxoplasma gondii. It involves an unusual process in which two daughter cells are produced inside a mother cell, which is then consumed by the offspring prior to their separation. Endopolygeny is the division into several organisms at once by internal budding. 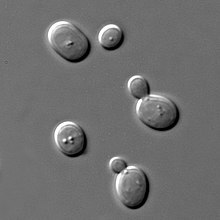 Some cells divide asymmetrically by budding, for example Saccharomyces cerevisiae, the yeast species used in baking and brewing. This process results in a 'mother' cell and a smaller 'daughter' cell. Cryo-electron tomography recently revealed that mitochondria in cells divide by budding. In some multicellular animals, offspring may develop as outgrowths of the mother. Animals that reproduce by budding include corals, some sponges, some acoel flatworms (e.g., Convolutriloba), and echinoderm larvae. Colonies of some bee species have also exhibited budding behavior, such as Apis dorsata. Although budding behavior is rare in this bee species, it has been observed when a group of workers leave the natal nest and construct a new nest usually near the natal one. In virology, budding is a form of viral shedding by which enveloped viruses acquire their external envelope from the host cell membrane, which bulges outwards and encloses the virion. In agriculture and horticulture, budding refers to grafting the bud of one plant onto another. ^ a b James Desmond Smyth, Derek Wakelin (1994). Introduction to animal parasitology (3 ed.). Cambridge University Press. pp. 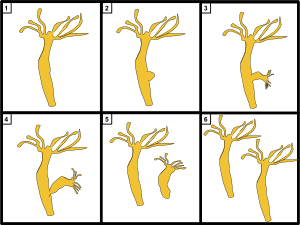 101–102. ISBN 0-521-42811-4. ^ Oldroyd, B.P. (2000). "Colony relatedness in aggregations of Apis dorsata Fabricius (Hymenoptera, Apidae)". Insectes Sociaux. 47 (47): 94–95. doi:10.1007/s000400050015.